Candidates should have Degree in this Recruitment process they must have passed SSC/ Higher Secondary/ equivalent from recognized board.. Interested and Eligible candidates Can apply online through the website www.bsf.nic.in on or before 31-10-2017. Candidates should have Degree in this Recruitment process they must have passed Matriculation or equivalent from a recognized University/Board. Candidates will be selected based on written Test,Physical Standard Test & Personal Interview. Interested and Eligible candidates Can apply online through the website www.bsf.nic.in on or before 11th October 2017. Candidates should have Degree in this Recruitment process they must have passed 10th/12th. Interested and Eligible candidates Can apply online through the website www.bsf.nic.in on or before 03-07-2017. 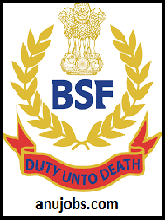 The Border Security Force (BSF) (Hindi: सीमा सुरक्षा बल) is the primary Border guarding force of India. It is one of the five Central Armed Police Forces of the Union of India, it was raised in the wake of the 1965 War on 1 December 1965, "for ensuring the security of the borders of India and for matters connected there with". It is a Central Armed Police Force charged with guarding India's land border during peace time and preventing transnational crime. It is a Union Government Agency under the administrative control of Ministry of Home Affairs. The BSF has its own cadre of officers but its head, designated as a Director-General (DG), since its raising has been an officer from the Indian Police Service. It is an Armed Force of the Union of India tasked with various assignments from time to time. The BSF has grown exponentially from a few battalions in 1965, to 186 battalions with a strength of 2.4 lakh (240,000) personnel including an expanding air wing, marine wing, artillery regiments, and commando units. It currently stands as the world's largest border guarding force. Candidates should have Degree in this Recruitment process they must have passed Diploma in Civil Engineering frorn an institute recognized by the Central Government or State Commencement. candidates have to pay Rs. 200/- through Demand Draft/ Postal Order in favour of the addressee to whom the application is addressed, payable at respective SBI/ Post Office at the location or nearby station and no fee for SC/ST/ Candidates. Candidates will be selected based on written Test, Physical Standard Test (PST), Physical Efficiency Test (PET), Interview & Medical Examination. Interested and Eligible candidates may submit their application form along with attested copies of relevant documents, Passport Size Photograph, with the Application Send to the on or before within 30 days from the date of publication of this advertisement. Candidates should have Degree in this Recruitment process they must have passed Graduation. Candidates will be selected based on written Test,Physical Standard Test,Medical Test & Skill Test. Interested and Eligible candidates Can apply online through the website www.bsf.nic.in on or before within 30 days from the date of publication of this advertisement. The age of the Candidates age should be 18 to 23 years as on 01-08-2016.Age relaxation is admissible as per rules. Interested and Eligible candidates can apply online through the website on or before within 30 days from date of advt. Interested and Eligible candidates can apply online through the website on or before 02-09-2016. Last Date For Submission of Application: 02-09-2016. The age of the Candidates age limit should be Between 18 to 25 years as on 01-08-2015, Candidates must have bee born not earlier than 01-08-1990 and not letter than 01-08-1997 for ASI & HC Posts, Upper age relaxation as per govt rules. Candidates will be selected by Written Examination, Physical Measurement (PST), Short Hand Test (only for ASI/ Steno), Typing Speed Test (for HC/ Min), Documentation and Medical Examination. Interested and Eligible candidates may submit their application on prescribed format downloaded from BSF website along with Self attested copies of matriculation certificate as a proof of age, Educational Certificates, 03 latest identical passport size photographs duly self attested (01 on application form and admit card each and 01 to be attached with application), 02 self addressed envelops affixed postage stamps worth Rs.40/- on each, Application and Admit Card signed by the candidates, Examination Fee, and other relevant documents certificates, envelope should be marked as "Application For The Post Of Assistant Sub Inspector (stenographer) Or Head Constable (ministerial) In Border Security Force 2014-15" and Sent to the authority center on or before 03-08-2015 and in respect of candidates belonging to far flung areas on or before 17th August 2015. The age of the Candidates age should be between 30 to 55 years as on 02-11-2015.age limit relaxation will be given as per the Govt.rules. Candidates should have qualification in this Recruitment process they must have Passed Degree from recognized university. Knowledge of Office work including Accounts, purchase, maintenance of stores and administration with 10 years experience for post no.1, Matriculate with typing speed of 30 wpm in Hindi or 35 wpm in English in Computer. Experience of three years in dealing with dispatch receipt, office procedure and maintenance of ledger and purchase procedure for post no.2. Interested and Eligible candidates may apply in plain paper along with self attested copies of relevant documents, bio-data, attested recent coloured photograph send to The DIG/Chairman, Polytechnic, Tigri Camp, New Delhi-110080 on or before 30-11-2015. The age of the Candidates age should be 52 years as on last date of receipt application.age limit relaxation will be given as per the Govt.rules. The age of the Candidates age should be 32 years as on last date of receipt application.age limit relaxation will be given as per the Govt.rules. Interested and Eligible candidates may apply in prescribed application form along with Two recent passport size photographs should be affixed on the application form. One each phonograph to be affixed on the application form and admit card. Self-attested copies of relevant documents send to respective Examination Centers as per official notification on or before 10.06.2016. The age of the Candidates age should be between 18 to 32 years as on 01-08-2016.age limit relaxation will be given as per the Govt.rules. Interested and Eligible candidates may apply in prescribed application form along with Two recent passport size photographs should be affixed on the application form. One each phonograph to be affixed on the application form and admit card. Self-attested copies of relevant documents send to respective Examination Centers as per official notification on or before 20.06.2016. Candidates should have qualification in this Recruitment process they must have Passed Matriculation with 3 year Diploma in Radio and TV Technology/ l0+2 for post no.1, Matriculation with 2 year Industrial Training Institute Certificate in Radio & Tv/ 10+2 from recognized board or university for post no.2. Interested and Eligible candidates can apply online through the website bsf.nic.in before 20.06.2016. 0 Response to "BSF Constable GD Recruitment 2017-18 at www.bsf.nic.in 196 Sports Quota Vacancy"